It is a measure of my love for the wild and for Sri Lanka’s fabulous parks that I go there again and again and take painkillers to see me through the day. It is 5.30 am. We have just finished Subh (Fajr as it is called in Sri Lanka and most Shafi countries including Kerala). And he walks in. The human conducting tower. His hair has the benefit of what I believe must be at least half a tube of gel, jet black, thick and all standing on end pointing in more directions than there are directions on the globe. They are so spiky that for a minute I wondered if Darwin would conclude that we were descended from porcupines, if he had met our friend. I suspect that they probably oscillate to catch the radio signal from wherever it may be coming. He carries a bright red Nokia phone of ancient vintage which can only make and receive calls. This it does when all our far more sophisticated and ‘smart’ phones are deader than a Dodo. It is still pitch dark, especially as we are in the heart of Yala National Park which means thick shade everywhere. Since we are photographers, my dear friend Ifham Raji and I and our other friends, Rizky, Zudy, Rizan and Kader don’t have night vision, I can’t imagine what we are getting late for? We continue with our preparations to go out on our drive, by first drinking some excellent ‘Ceylon’ tea. Accompanied by biscuits.Being a ‘Tea man’ myself, I always appreciate good tea and lament its destruction. In Sri Lanka, the amazing thing is that no matter who makes your tea, it is always of the standard that you would expect from a high-grown Nilgiri estate. Our bungalow bearer sets out the tea in a proper tea pot with a milk jug, matching tea cups, saucers and sugar bowl on the dining table. A level of service that reminds me of my butler, Bastian and our bearers Asaithambi and Armugham. The quality of service complements and adds to the taste of the tea. Meanwhile our ‘Murshid’ (Arabic for Guide or Murshid-us-Sayyarah, Driver) is getting more and more impatient at our inability to jump to his command. Eventually, he leaves in disgust to talk on his phone; his constant companion, part of his right hand and the adhesive that attaches his hand to his ear.Having finished our tea and loaded our camera equipment and ourselves into the Mahindra Bolero ‘Jeep’, we set off for our morning ‘safari’. Sri Lankan national parks use several different ‘safari’ vehicles. Toyota Hilux, Toyota Land Cruiser, Land Rover and Mahindra Bolero. Of these the Mahindra Bolero ‘Jeep’ is the most uncomfortable and potentially unsafe. To put it mildly, given the combination of the absolutely atrocious roads which have craters instead of potholes and the Mahindra Bolero’s short wheelbase and high cabin bed, you get to experience the term which used to be on all medicine bottles in the old days, ‘Shake well before use’. I know that there are six basic directions; forward, backward, right to left, left to right, upwards and since there is gravity, downwards. But I never knew that it was possible to experience all of them simultaneously until I rode in a Mahindra Bolero ‘Jeep’. What this obviously does to your spine and all your internal organs I can well imagine. It is a measure of my love for the wild and for Sri Lanka’s fabulous parks that I go there again and again and take painkillers to see me through the day. But a word of advice, if you are ever in a Sri Lankan national park, avoid the Mahindra Bolero ‘Jeep’ like the plague. I sincerely hope that Sri Lankan National Parks Authorities repair the roads. In the current state, the wear and tear on vehicles and on poor unsuspecting human beings is pitiable. Repairing roads would enhance the wildlife viewing experience while adding years to both vehicles and tourists.Add to this our driver’s style of going at breakneck speed (no matter that the speed limit is 25 km/hr), screeching to almost a halt at a particularly deep crater while bashing on regardless through anything less than 2-feet deep and you have an experience of mortality that can’t be equaled. Another charming trait of our driver was that when he came to a one-way road, he would simply reverse down it, at the same speed as he would have done if he were driving forwards, while glancing occasionally at his side mirrors. Imagine this (I experienced it multiple times) when that road is the raised bund of a lake with the water and crocodiles on one side and a drop of about 30 feet on the other and there you are racing down it, backwards. Since he has very little English and I have no Sinhala I couldn’t check this with him, but I assume his theory is that it is only prohibited to go down a one-way road nose first. If you go hindquarters first, then your nose is pointed the right way and so it permissible. 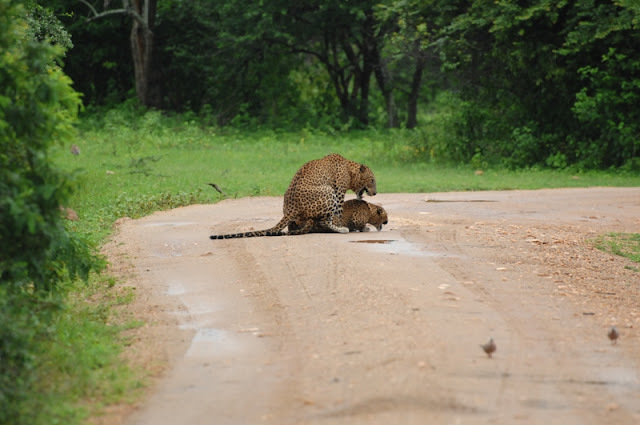 So, there we were, holding our breath, hanging on to our camera equipment and trying to remain attached to whichever part of the Jeep that came to hand while trying to spot the evasive leopard, in whose aid all this was being done anyway.Talk about multitasking. Why did we not stop this flirtation with the other dimension? Well, for one, short of the application of a blunt instrument to the back of his head, there was no way to stop him and none of us wanted to spoil his hair setting. All that gel, remember? And for another, you need a limb to apply said blunt instrument to the back of the aforementioned head. All ours were engaged in keeping us attached to the Jeep. See?It was that lazy part of the afternoon when everything is still. Not a leaf moved. Not a gust of breeze. It was not as hot as it can get but was getting there. The bungalows in Yala and Wilpatu are beautifully located. Our bungalow was on the bank of a river which flows just a few feet below. Totally tranquil. The bungalow design is more or less standard, with two rooms, two bathrooms and an L-shaped wide, open veranda with a low parapet wall on two sides. You can sleep in the rooms, but usually you sleep on the veranda under mosquito nets. You eat on the veranda which is big enough for a table seating ten people. There is a kitchen just off the veranda. In the veranda is also a wash basin for you to wash your hands after your meal. More about that in a minute.Nothing to beat the atmosphere, listening to the sounds of the jungle, especially in the night and early morning. Bungalow maintenance can be better, which we discovered when it rained one day. Both rooms leaked heavily though the bungalow had been recently renovated. We were all relaxing or more accurately, recuperating from the morning drive, waiting for lunch to be served. Suddenly, the bearer came rushing in and said, ‘There is aThithPolanga (Russel’s Viper’).’ He had good reason to be afraid as the Russel’s Viper has the record for highest number of fatalities in Sri Lanka. It’s poison is particularly venomous exceeded only by that of the Saw-scaled Viper. More about this snake here http://itsmejumbo.blogspot.com/2013/08/russells-viper-ultimate-viper-in-sri.htmlAll of us leapt out of our beds and ran outside to see what the bearer had discovered. Think of ten reasons that your sink may be blocked. I bet one of them is not, “6-foot young python lost his way.” That’s what had happened. The cook and his helper first thought it was a Russell’s Viper and wanted to kill it. But I identified it as a young python who got there chasing the little frogs of which we have a profusion. He slid up the drainpipe and got stuck. The standard solution was once again proposed but I vetoed it. I then caught it and released it in the forest. Did wonders for my mystique. I wisely remained silent about the fact that what I did was easier than taking off my hat. Sometimes silence does more for you than all the talk in the world. It is not surprising that the bearer thought it was a Russel’s Viper because there is some similarity in markings. But that is where it ends. The young python was totally harmless and would have been in danger of meeting a nasty end thanks to people’s fear of snakes. Snakes are highly beneficial in that they keep rodents under control. Had it not been for snakes we would be run over with mice and rats.My friend Ifham took a video of the event. So much for a lazy afternoon in the bush.The bungalow premises have a lot of shade trees. One of them right opposite the front door has a hollow high up on the trunk. I saw a couple of parrots on the tree and suspected that they were nesting in that hollow. Then one afternoon, as I was dozing on my cot, I heard the parrots screeching and making a lot of noise. I got up to see what the matter was and discovered a monitor lizard coming out of the hollow. Sadly, neither I nor the parrots spotted him climbing the trunk and so by the time the parrots got their act together, the lizard had had his dinner. There is a great profusion of Monitor Lizards in Sri Lanka and they are excellent climbers. Using their claws, they simply walk up the trunk of the tree. Once they discover a nest, then it is curtains for the eggs and any chicks. The adult birds usually fly away but their grief can be seen and felt long after. Nature is relentless. One dies, so that another can live.There is one downside of the forest bungalows or more correctly of people who stay in them. They provide food for animals. There are squirrels and Bonnet Macaque monkeys which steal. The latter are extremely intelligent about it. They know when new guests come and are unloading their cars, that it is a time when they are least vigilant and leave foodstuff unattended as they unload other things. The monkeys literally lie in wait and rush in and grab what they can. One got all our bread supply for the week. Others like the two big wild boars that come at night, come for the leftovers and garbage that is simply thrown out of the kitchen or flows down the kitchen drain. Just as dusk is falling the two come out of the forest and start rooting around. Interestingly there is a troop of Langurs, which doesn’t behave like the Bonnet Macaques and don’t come to the bungalow. They hang around the trees, with their young doing all kinds of acrobatics on the branches. You can literally sit for hours and watch Langur young at play while the elders engage in mutual grooming. Those who know Langur culture know that the grooming is strictly controlled and is a mark of social status with the higher-ups being groomed by their inferiors. In this milieu one night we finished our dinner, followed by a cup of excellent Ceylon tea and had retired when our driver, he with the gelled hair, came running and said, ‘Kotiya!’ (means ‘tiger’ but in Sri Lanka it means ‘leopard’). We rushed with him to the servant’s quarters. He shone his torch and there he was; an almost mature juvenile (does that sound oxymoronic? ), about 20-feet away looking at us. He then looked around as if searching for something and then very slowly walked away in to the forest. Imagine spending all day haring around all over the park looking for leopards in vain `and one comes calling in the night! The trill of seeing a big cat is unequalled by anything else. The story was that for reasons best known to the ‘establishment’ the bathroom/toilet for the servant’s quarter is built a few meters away from the house. Why it can’t be attached like it is for the bungalow is not known to me. But the result is that if one of the servants needs to relieve himself, he must go out of the house and into the bathroom/toilet. The cook said that (very wisely) his practice is to first scan the surroundings with his torch before venturing outside in case there is a bear or something else around. The whole area is unfenced, which means that any animal can come into the compound. This night he shone his torch and he saw this leopard sitting a few feet away, watching him. The cook sent the driver to call us. The driver jumped over the parapet wall and came for us, while the leopard moved over to the other side of the house. To be frank, neither the cook nor any of us were in any danger from the leopard, which was a juvenile. But had it been a Sloth Bear or an elephant, it would be another story. Even with those however, if you stay inside the house, there is no danger. That is why the bungalows have open verandas on which you sleep safely and perfectly soundly. The only sign of a leopard on the premises would be peacocks calling their alarm, picked up by the Langur who boom out their calls while shaking the trees in which they roost. Leopards are excellent climbers and are famous for catching Langur and other monkeys as well as peacocks, as they roost in the night. Nobody knows this better than the Langur and they make sure everyone knows the wily ways of the leopard as well as make it hard from him to retain his footing if he is indeed clambering up to them.It was our last day in the park and as we rounded a bend, we saw this massive, majestic elephant,holding his trunk in his mouth,walking towards us down the middle of the road. At that moment our engine stalled and no matter what our driver tried, it wouldn’t start. I think the Jeep wanted to register a protest at the way it had been treated and chose a particularly delicate moment to do it. I say delicate, because as the elephant neared us, we could smell the strong smell of his Musth-gland secretion. Musth is a periodic condition that male elephants undergo when they have heightened testosterone levels (more than 6 times the normal) which makes them aggressive and violent against other elephants and humans. https://en.wikipedia.org/wiki/MusthThe signs are the secretion from the Musth-gland in front of the ear and almost constant urination which colors the hind legs, black. This bull exhibited all the signs of Musth and was coming towards us and we had nowhere to go. But to my great relief and surprise, he merely moved to the side and walked past us, stopping briefly to face us and take a good look and then moved off into the forest. That leads me to believe that the nature of Sri Lankan people, politeness, dignity and kindness combined with great law abidance also extends to wild elephants of Sri Lanka. He was a magnificent sight and left his strong smell in our nostrils and his majesty in our hearts for a long time. Yet another beautiful trip to Yala.